Email marketing still remains the most effective marketing measure. As 77 % of consumers prefer email over other online channels, it should therefore not be forgotten in the marketing mix. But why is email marketing particularly important for hotels? Read our tips on how you can take advantage of it and build guest loyalty. Compared to other industries, hotels can gather customer data rather easily from bookings. In doing so, it is important to make sure to get your guests' permission to send newsletters and offers by email – not only to stay on the right side of anti-spam laws, but also to avoid annoying them. There are many ways of growing your subscribers list, e.g. by including a check-box for newsletter subscription during the booking process or by adding a pop-up for signing up to your website. The probability of people registering for the newsletter increases by offering discounts. 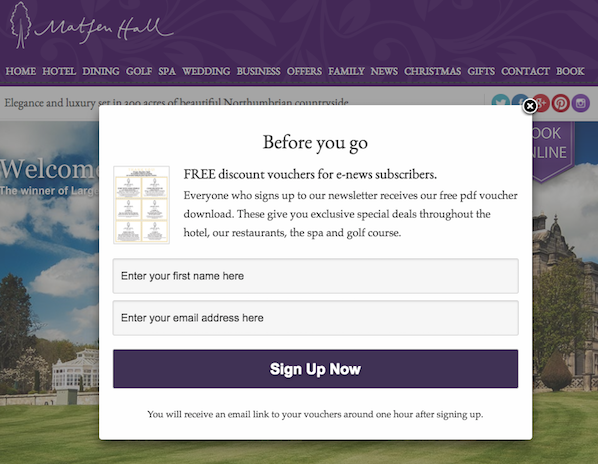 Matfen Hall offers a discount for the next stay as a reward for newsletter subscription. Email marketing can help you to establish a more personal relationship with your customers. While doing so, personalization is an indispensable requirement. You have to know your customers and target your messages according to their interests. One example: A guest who is eating in your restaurant regularly will most probably appreciate special dinner packages. Use existing data to build segments and send them relevant content. Click-through rates are improved by an average of 14 % and conversions by 10 % if messages are personalized. Targeted messages that match the customers' interests are a good way of keeping in touch. But there are way more occasions for sending out newsletters, such as birthdays or seasonal offers. If your customers didn't plan the next stay yet, this might help to push them a little bit. 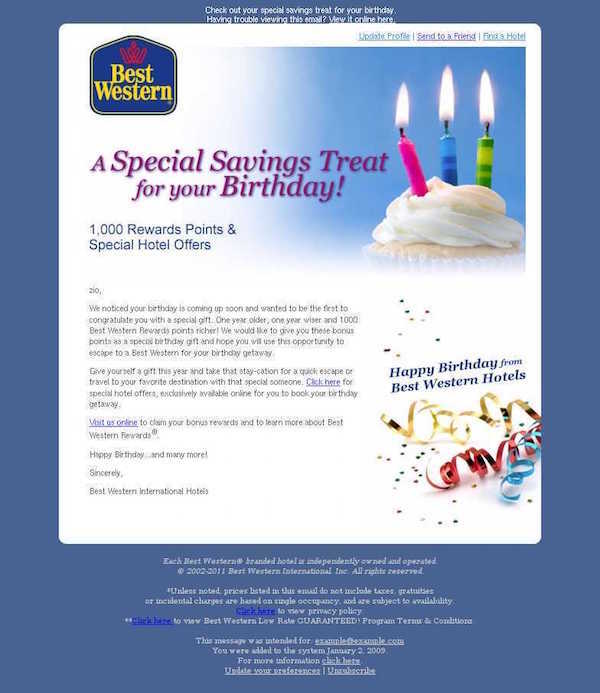 Best Western is giving away 1,000 extra rewards points as a special birthday gift (source). 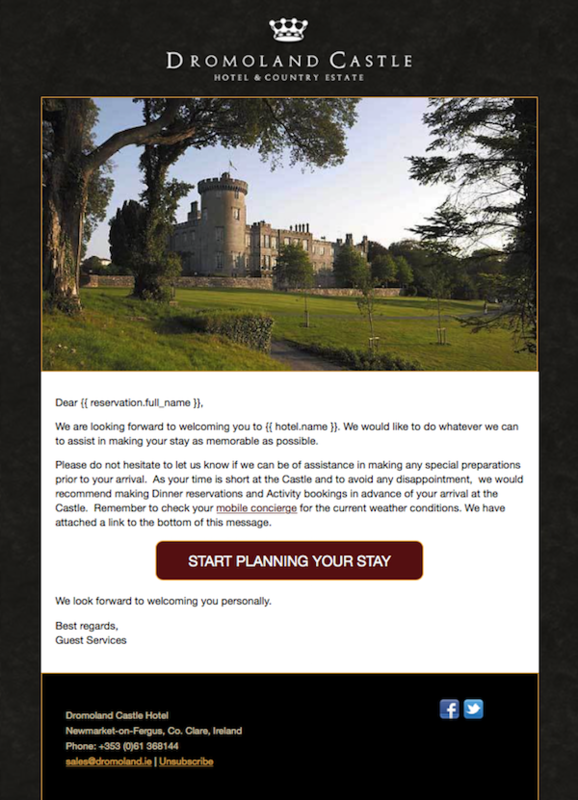 Dromoland Castle Hotel offers its services already before arrival (source). To follow up after the stay, post-stay emails are a great way to keep in contact with the guest. In terms of content, such emails are the perfect opportunity to ask for feedback. This does not only help to improve your services, but you also get the chance to respond directly and react to any positive (or negative) experiences the guests made during their stay. To increase the response rate you might, for example, offer a discount for the next booking. 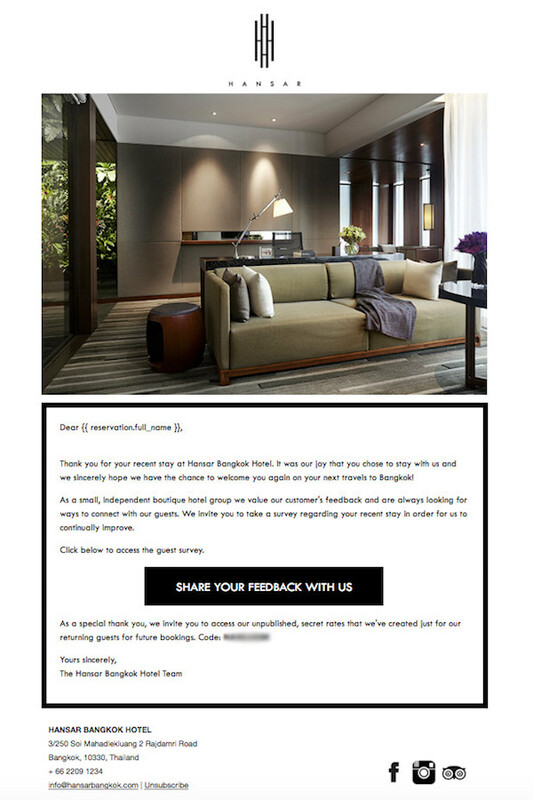 Hansar Bangkok hotel is asking for customer feedback after the stay and offers discounts for the next stay as a reward (source). When it comes to the content of your newsletters you don’t always have to offer discounts or special services. Be a guide for your guests and recommend nearby attractions or events. Think about what might be interesting for the different segments of customers you have and create exciting content for them. Good content is content that provides benefits for your customers. Pre- and post-stay emails, welcome messages, birthday cards, Christmas offers, monthly newsletters... You can hardly manage your email marketing without any automation. An automation platform combines data from different sources and helps you to manage your emails. This allows you to track which offers and services are most interesting and adjust your content to match your customers' needs. Compared to other marketing activties email marketing is relatively inexpensive and has a high ROI. According to DMA National Client Email Report one out of five companies reports an ROI of over 70:1 for email marketing. Needless to say that investing into a professional newsletter software and a marketing automation platform really pays off. Here are some hints how you can find the ideal newsletter software and how you can get started with marketing automation. Nina is the Marketing Coordinator for the German market at Liana Technologies and helps our German customers become digital marketing rock stars. Besides her job she loves Finland’s northern wilderness as well as going to music festivals and traveling across Europe. You can connect with her on LinkedIn. Great article! We've been actually considering lately marketing automation, but we weren't sure if that's what we may need. When is the right time to switch? We've been looking at solutions like Hubspot or GetResponse. All of your marketing channels should be consistent. Make sure that your holiday email content is available on all of your social media channels. This will ensure that your audience sees your content, even if they aren't checking their emails.